The project here is all about Front wheel Steering system with movable headlights with latest electronics technology. The most conventional steering arrangement is to turn the front wheels using a hand–operated steering wheel which is positioned in front of the driver, via the steering column, which may contain universal joints to allow it to deviate somewhat from a straight line. Other arrangements are sometimes found on different types of vehicles, for example, a tiller or rear–wheel steering. Tracked vehicles such as tanks usually employ differential steering — that is, the tracks are made to move at different speeds or even in opposite directions to bring about a change of course. to turn in a significantly smaller radius — sometimes critical for large trucks or vehicles with trailers. An electronic four-wheel steer system is an option available on the JCB Fastrac. Many modern vehicles offer a form of passive rear steering to counteract normal vehicle tendencies. For example, Subaru used a passive steering system to correct for the rear wheel’s tendency to toe-out. On many vehicles, when cornering, the rear wheels tend to steer slightly to the outside of a turn, which can reduce stability. The passive steering system uses the lateral forces generated in a turn (through suspension geometry) and the bushings to correct this tendency and steer the wheels slightly to the inside of the corner. 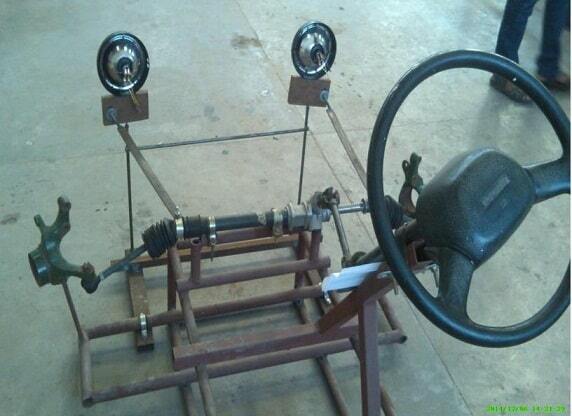 This improves the stability of the car, through the turn. This effect is called compliance understeer and it, or its opposite, is present on all suspensions. 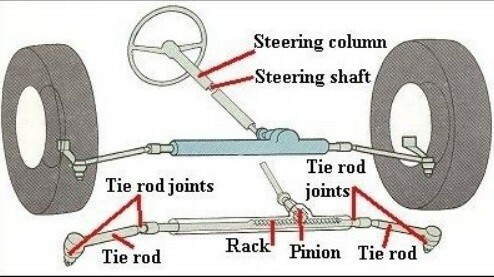 Typical methods of achieving compliance understeer are to use a Watt’s Link on a live rear axle, or the use of toe control bushings on a twist beam suspension. On an independent rear suspension it is normally achieved by changing the rates of the rubber bushings in the suspension. Some suspensions will always have compliance oversteer due to geometry, such as Hotchkiss live axles or a semi trailing arm IRS. This invention relates to a car headlight and more particularly, to a movable car headlight device which, when turning the car, illuminates the area into which the car is turning. Conventional headlights and auxiliary lights are generally fixed at a certain angle to the front of a car body for lighting up the area in front of the car. Therefore, upon turning the steering wheel to change the direction of travel of the car, the front-wheel forms an angle corresponding to the angle at which the steering wheel was turned in relation to the direction of travel of the car. Thus, the car body moves in a direction which is not being illuminated by the headlights and therefore poses a danger because it is turned into a dark area. It is therefore an object of the present invention to provide a novel headlight device for cars, which is designed so that when turning the car it automatically directs a light in the direction in which the car is turned. More specifically, the movable car headlight device of the present invention comprises a perpendicular main axis fixed to a bracket mounted on an appropriate part of the car body; a receiving table through which the main axis passes; a rotating body with balance weights on either side attached to the main axis the body rotatable resting on the receiving table; and a casing with a lamp at its rear part rotatable supported at the upper end of the main axis. The casing is connected to the rotating body so as to allow the rotating body to rise or fall independently and co-rotates with the casing. The receiving table and the rotating body are adapted to contact each other in the form of a V-shaped wedge so that the rotating body is allowed to ride up from the contact surface as it is rotated due to centrifugal force exerted by the balance weights caused by the turning of the car, whereby the casing having a lamp is rotated and the rotating body is given a restoring force due to potential energy accumulated by riding up the V shaped surface of the receiving table.